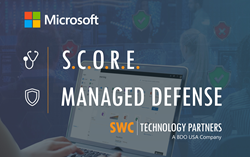 SWC Technology Partners, a BDO USA Company, announced an expansion of their Microsoft integration alongside the introduction of two unique threat-based cybersecurity solutions to help organizations prepare for and respond to evolving cyber threats. SWC understands our commitment to helping customers protect, detect and respond to cyber threats. This relationship with SWC and BDO builds upon that commitment to bring innovative security solutions to market to help our customer remain competitive in today’s ever evolving threat landscape. SWC’s SCORE Threat-Based Security Maturity Model was developed closely with Microsoft to perform a data-driven evaluation of over 160 points of security control and provide an organization with a baseline rating of their current environment. This data is then leveraged alongside business context to prioritize security initiatives from a holistic view of threats. This framework provides organizations with a data-driven framework to make security decisions based on their individual vulnerabilities and maximize return on security spend. SWC’s Managed Defense service, also developed with help from Microsoft, provides a high-impact, ongoing automated security service that leverages Microsoft advanced security capabilities including Microsoft Graph Security API, Windows Defender Advanced Threat Protection (ATP), Microsoft Azure Active Directory Identity Protection, and Microsoft Cloud App Security. Managed Defense will allow organizations to stay ahead of cyber threats by using artificial intelligence to identify suspicious behavior and allow organizations to quickly surface and remediate threats. Together, these offerings provide organizations with a focused, customized strategy to improve their security posture supported by a team of experts to help them detect, analyze and respond to the pervasive threats that is the new reality of today’s digital landscape. SWC is working with companies to strengthen their security posture with these solutions. Customers should also continually reassess their security maturity based on an ever-changing landscape to reduce their risk.